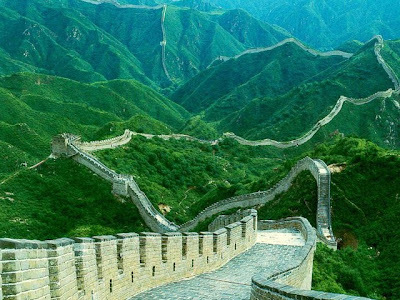 The largest engineering and building project ever carried out by humans is the Great Wall of China. It stretches about 1,500 miles (2,400 kilometers) from Bo Hai, a gulf off the Yellow Sea in the east, to a point deep in Gansu province in the west. Parts of the enormous structure date back to the 4th century BC, but the earliest major work on the wall came during the Ch'in Dynasty, which lasted from 221 to 206 BC. The emperor Shih Huang Ti had united the different parts of the country into one China in about 214 BC. 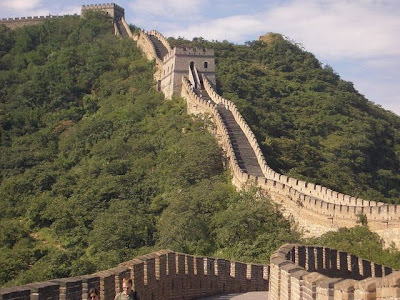 He ordered the existing sections of wall to be connected to form one long wall as a protection against invading nomads, or wandering tribes, from the north. The nomads he was especially concerned about were the Hsiung-nu, sometimes thought to be forebears of the Huns. Since that time it has been extended, rebuilt many times, and destroyed in part. But it still stands and has become one of the major tourist attractions in the world. The wall is simple in structure. It is built of dirt, stone, and brick. Its height ranges from 15 to 30 feet (5 to 9 meters), with watchtowers rising at regular intervals above it. It is 15 to 25 feet (5 to 8 meters) wide. Along the top runs a 13-foot- (4-meter-) wide roadway. Behind the wall there are at intervals permanent camps for troops. 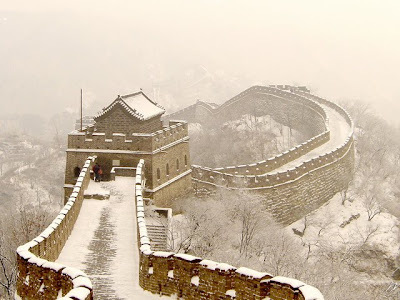 The wall's use as a defensive barrier ended in 1644 with the collapse of the Ming Dynasty. Parts of the wall fell into disrepair, but in the 20th century parts were rebuilt. A new visitors' site was opened at Mutianyu, northeast of Beijing, in 1985. 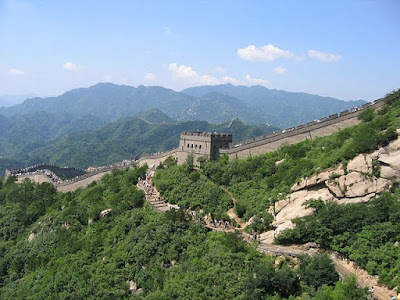 It shares the tourist traffic that was previously concentrated at Badaling, northwest of the city.